1 of 3 In a medium-size bowl, beat egg whites with an electric mixer to stiff peaks. Set aside. In a second medium-size bowl, combine egg yolks, vegetable oil and salt. Beat together until thick and yellow colored, about 2 minutes. Beat in 2 tablespoons of the broth. Fold in egg whites, then matzoh meal, garlic powder and dill. Cover bowl with plastic and refrigerate 30 minutes. 2 of 3 Bring a large pot of lightly salted water to boiling. With wet hands, roll about 2 teaspoons batter into balls. Drop into boiling water; continue shaping batter for a total of about 24 matzoh balls. Cover pot and cook over medium heat for 30 minutes. 3 of 3 Near the end of cooking, heat remaining chicken broth to a bare simmer. 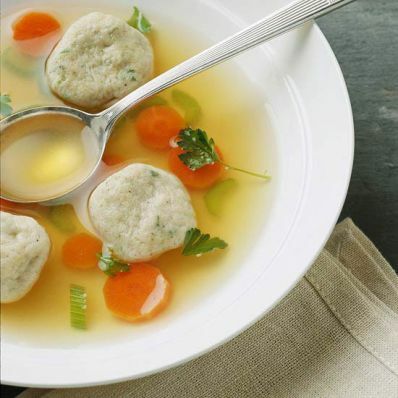 Once matzoh balls are cooked, transfer to simmering broth with a slotted spoon. Cover and cook 10 minutes. Serve garnished with fresh dill sprigs, if desired. Makes 8 servings. Per Serving: 269 mg sodium, 3 g pro., 122 kcal cal., 2 g sat. fat, 0 g fiber, 57 mg chol., 9 g Fat, total, 7 g carb.